Welcome to our review of the Best Nutrients for Growing Cannabis! Growing cannabis has become big business over the years. With more and more legal legislation changes in the US and other countries, the growing of cannabis is no longer stigmatized. It is grown for recreational use as well as for medicinal purposes. It will be smoked, used in a vaporizer, cooked into foods, or even taken as a tincture. So it is important that it is grown correctly to produce the best usable product in the end. Cannabis growers know that using the wrong marijuana plant food, fertilizer or other additive can drastically affect the taste of cannabis, how well it smokes, as well as its effectiveness. Using the proper and best cannabis fertilizers and nutrients available is the only way to ensure a perfect end product from your grow. Here are the top nutes currently used by most marijuana growers today. Advanced Nutrients is the most recommended product line for growing cannabis of all kinds. All of their product line is made of only the very best and most nutritional ingredients. 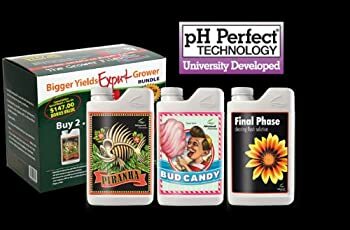 Both advanced and beginner growers will love how their plant grows turn out after using this product. It is hard to find a bad review for Advanced Nutrient products. Ask any grow shop retailer what are the best nutrients for cannabis and Advanced Nutrients will be at the top of the list. Advanced Nutrient products come in many different sizes. This starter pack includes all their nutrients you’ll need for each stage of growth in one package for convenience. These are the 4 major weed nutrients in the Advanced Nutrient product line: Big Bud, B52, Voodoo Juice and Overdrive. This product line has received great reviews from all its users. Seasoned growers love it and it is a perfect choice for beginner growers as well. By using these products as directed it is easy to grow a great garden indoors or outdoors. Your plants will grow big, healthy and fruity. Once you have used Advanced Nutrients and seen what a difference it can make in your plants you will never want to use another other nutrient blends. The propriety formulas surpass all other nutrients on the market in the way of promoting big and healthy plants. This is truly the best nutrient you can buy for growing Cannabis. The FoxFarm product line is only second to Advanced Nutrients amongst its many users. It is a three solution product that you use with each growth phase. 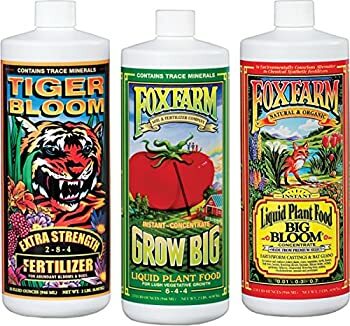 FoxFarm products are excellent for growing larger, thicker and greener plants. Cannabis buds will be denser over time and you can even use the products during the later part of the plant growth unlike other products. Users who have tried FoxFarm products have had great results with it. The cost is much lower than that of other competitor products for growing Cannabis. General Organics has gained in popularity over the years. Farmers and gardeners specializing in organic growing have developed a large following with this product. It works great for both soil gardening and water or hydroponic cannabis gardens. If you’re looking for the best organic nutrients for cannabis, General Organics should be on your list. These cannabis nutrients are formulated from natural botanical extracts and natural minerals. 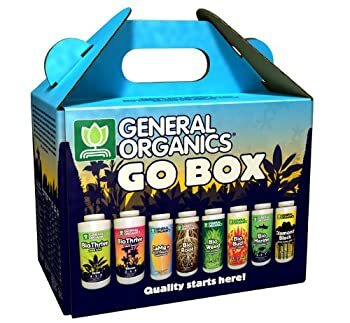 General Organics offers a whole line to fit with every phase of growth from seedlings to flowered buds. 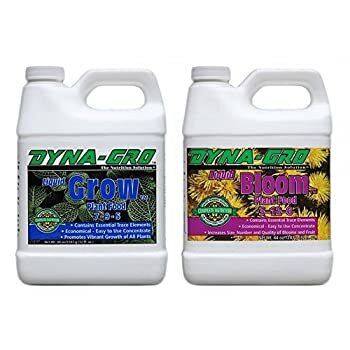 Dyna-Gro Liquid is another top favorite fertilizer for growing weed. Their blend of essential micro and macro nutrients is perfect for growing cannabis at all stages. It is also good for growing other types of plants, vegetables, flower gardens, trees and even indoor houseplants. Rose bush growers love this product as do marijuana growers. The buds bloom nicely from stems to full on flowers. Cannabis plants produce nice and thick nugget like buds and bloom into major nugs at the end of the growth cycle. Plants produce flavorful smells and quality tastes. Dyna Gro products provide plants with a complete nutrition plan. Great quality products for a low cost. This product line contains 16 essential minerals for maximum plant growth. Quick absorption by plants. Works well with both water systems and soil mixes. This product line is so easy to use. You don’t have to do any special mixing of chemicals. Everything you need is in one bottle. Users of this product have rated it very highly in online reviews. Botanicare has a long line of products geared at growing plants, cannabis included. For the price of one bottle you can feed your whole grow room. Cannabis and other plant growers gave this product high marks and highly recommend it for any type of plant growth. This product is great for producing high plant yields. Unlike other nutrients, this one is a professional strength product. It has the perfect blend of 17 minerals. 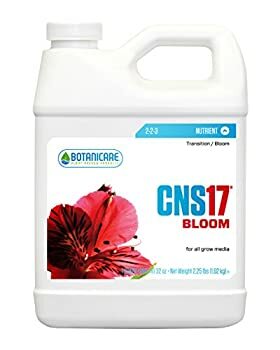 The CNS17 is one of the best products from Botanicare. It is a proprietary blend made for plant growth during every stage from seedlings to ripening blooms. You get premium results in your plants after using this product. You can use it in all types of all grow media. It helps keep soil at its healthiest supporting root growth. The NPK nutrient ratio in CNS17 Bloom was designed to provide specific critical elements to support heavily fruiting and flowering crops. Your plants won’t suffer from any sort of nutrient overdrive or nutrient burn. Growing cannabis or other delicate plants requires the best nutrients you can buy. All of these products offer maximum support to your plants. Each one is made of specially designed formulas that will help keep your plants healthy and support a strong and high yielding plant. Cannabis growers give all of these products 4-5 stars with minimal to no complaints. Advanced Nutrients does seem to offer the largest product line. However, each one of the weed nutrients we’ve featured is great for plant growth. The only difference is in cost and ingredients. No matter which of these nutes you choose you won’t be disappointed—and your plants will be very happy too. New to growing marijuana indoors? 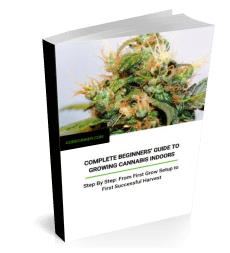 Check out our Step-by-Step Beginners’ Guide to Growing Weed Indoors and Setup Guide to learn how to get started and well on your way to your first successful harvest. has anyone ever tried trz nutrients from the root zone in canada? Have been using Biobizz range pretty successfully for a while now and am quite happy with the results. . does anyone here know if changing to the above mentioned nutes is worth the risk and expense? I have ran Gh, botanicare with ok results……… nothing to rave about. I’m first time grower indoor what should I use that isn’t so difficult to follow but will have excellent results any help will do , I’ve been reading the comments up there I just need what’s best for indoor beginner . As you’re a beginner, I’m assuming you’re going with a soil grow(?). So, first off, be sure you’re getting nutes formulated for soil rather than for hydroponics. The Fox Farms nutes we listed above are a good beginner’s choice for soil grows. Here’s the feeding schedule on their website: https://www.foxfarmfertilizer.com/images/pdf/usa-soil-schedule-english_3-2018.pdf (PDF). Hopefully that should get you started. Alternatively, if you want to keep things really simple, just get some soil formulated for cannabis (Fox Farm Ocean Forest is a popular choice or their HappyFrog soil). There are a few options available. But avoid things like Miracle-Gro soil that have extended release nutrients – you can end up with the wrong nutrients still being in the soil during flowering. Good luck and all the best with your grow! Using Earth Juice Seablast Grow/Transition/Bloom with EJ Bio Righteous and HI Brix First yr. Not impressed plants smaller. Going to worm casting next yr. While all this is of interest, I still find it difficult to make a selection because it appears these products are to be used in those Hydroponic Growing systems, not Soil. I’m a newbie & my first time I bought a Kit for Veg. (A-B) & Flower (A-B). When I got it, I found the directions for how to add it to a hydroponic system. I used it in my soil, scaled back in strength but, I spent that whole Time & expense only to end up with garbage. Why can’t these companies make it clear if the product is for Soil or Hydro ? Not sure what product you bought that did not work for you. If it was a light, consider that the grow medium (dirt or water) really has no relation to how the plant responds to various light frequencies. If you are a hydro grower, that is a very technical and equipment intensive endeavor, but the light should not make a difference. If you have read our free e-book (find it on the right sidebar), then you might want to buy a more comprehensive Grower’s Bible. You can find that here. Im running Canna for my first grow ever solo grow, but have been working with a friend for years who runs Botanicare. I am extremely impressed with the Canna product line and while expensive, a video from BLG (Big Little Growers) on you tube gave me a feeding schedule that was dialed back slightly and still is producing an impressive crop. My friend used Botanicare and had inspiring results. Garden or farm can be made rich by using bloom booster fertilizer which is natural. As per nature if you follow natural things it will result long to you fertile soil. Chemicals destroy earthworms which are very much important for the soil. Canna nutrients is what I am currently using. I have had great results with all. They just grow differently with each line. Thanks for your advice. Hope you will sign up for our growing community ( on the front page at 420beginner.com) so taht we can include you when we add a forum for members. House and Garden is very simple and cost effective. I am starting a medium MMJ commercial grow and was considering Humboldt but I dont see many reviews. I am strongly thinking about going organic as well. Please offer opinions!! Advanced Nutrients line is very good for growing cannabis. Some say over hyped others say good marketing. They are pricey but worth it. You will not be disappointed. What happened to the expensive Canna? They didn’t make this list. I have been using GH for the three years I have been growing. Gh seems good enough but if some thing yields better then the price increase is a drop in the bucket. I am ready to try something else but still want it to be simple. Advanced Nutrients has a expert set and a grandmaster set so all of the sudden the 3 bottles shown here don’t sound complete at all. Excellent goods from you, man. I have understand your stuff previous to and you are just extremely great. I really like what you have acquired here, certainly like what you’re stating and the way in which you say it. You make it entertaining and you still take care of to keep it sensible. I can not wait to read far more from you. This is actually a great website. Advanced Nutrients is pure hype and can be very confusing to boot.Far to many redundent additives in that lineup. GH products are very effective and less expensive.A very consistent and totally pleasing crop can be produced easily each and every time with GH. I have also found the DynaBloom to be a excellent stand alone in flowering.TIP- always use a potassium sulfate additive during late flowering because it is depleted very rapidly from the solution at this stage of ripening. Don’t be fooled into thinking your plants need PK, they don’t ; they need just the potassium. Take this advice your plants will have great aromas and wonderful tastes. You are absolutely correct about advance nutrients and also 100% correct about GH. Lol its a safe bet you guys haven’t really used there line up or you wouldn’t be blasting them. They are top shelf. And ment for cannabis. Advanced and Canna are what all the top growers are running so why do you knock it? Is it because your a parrot and repeat what you’ve heard from other low level uneducated growers??? I just don’t get it in fact you only continue the bad reputation of the dump stoner stereotype. You can’t use any of that in hydro and hydro is where the big boys play. Thanks zombie,dirt farmers are so in the dark can’t imagine getting nutrient block and having to walk plant after plant to a warm water source. I just turn a valve. Can you tell me anything about Chemgen? Not on our list of reviewed products but we will add it. I think advanced nutrients is really helpful for plants. Either you start from seed or from clones.